Note: This article is not written to advise people to treat themselves with coconut oil. It is for informative interest only. 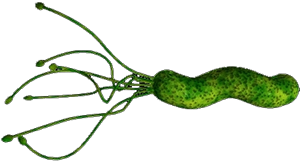 The Helico Pylori Bacteria is one of the most common bacteria that infect the Human race. It is found in families, who pass the bacteria to each other. H. Pylori inhabits the stomach and the esophagus. It stimulates cells in the stomach to produce excessive amounts of gastric or hydrochloric acid. This acid reflects back and up into the stomach causing “Heart burn” or, technically, Gastro-Esophogeal Reflux /Disease, commonly referred to as GERD. This reflux is painful and can cause ulcers, gastritis and occasional gastric cancer, which can be deadly. There are dozens of diagnostic methods for determining the presence of H. Pylori, and dozens of treatments devised by major pharmaceutical companies who make billions of dollars with disease. The normal treatment consist of an accurate diagnosis using an analysis of breath from the patient which contains gas byproducts of the bacterium, followed by an average ten day treatment of six antibiotics daily, plus two proton pump inhibitors daily. (Prevacid, etc.) At the end, the patient is retested for the presence of H. Pylori. There is an approximate 90 percent success rate, sometimes 70 to 80 percent. COST: $300 – $500, if no insurance. SIDE EFFECTS: diarrhea, stomach complaints, overgrowth of bad bacteria. TIME COSTS: visits to doctors and laboratories. Treating H. Pylori infections medically, is costly, time consuming, produces side effects and is not one hundred percent successful. Many of my patients who have studied alternative medicine on the Internet, have asked my opinion about Virgin Coconut Oil for the treatment of Pylori Infections causing hyperacidity. My method of studying a new plant or drug is to first learn the chemistry of the plant or drug. I must know the molecular structure and how the molecule interacts with other molecules in the body. Without this knowledge I would be like a carpenter that doesn’t know whether a nail will pierce steel. This knowledge requires research into the description of the molecules, its various chemical properties and the physiological properties of the body molecules that will be affected. Over thirty years as a Physician makes this task arduous, HOWEVER, I have learned to do the research and abstract the conclusion. Coconut oil is an excellent “anti-biotic”. It kills bacteria and fungi on contact! Coconut oil is made of saturated fatty acids of the medium length variety. Its major Saturated Acid is called LAURIC ACID. The Lauric Acid invades the cell wall and destroys it. “Studies on lipids in the 1960s by Kabara and colleagues showed medium-chain (C-8 to C-14) FAs and their monoglycerides to have antimicrobial effects against several laboratory organisms. In the 1990s, more laboratory studies confirmed the antimicrobial activity of these lipids against gram-positive and some gram-negative organisms, including Neisseria gonorrhoeae, Helicobacter pylori, and Chlamydia trachomatis, as well as Candida albicans yeast and enveloped viruses. Since 1998, some clinical studies have confirmed these laboratory data, specifically data on monolaurin, the monoglyceride of lauric acid from VCO. A 2% gel preparation of Lauricidin (Skin Sciences Laboratory, Inc, Pasig City, Philippines), which contains 90% pure monolaurin, significantly degermed SA cultured from health workers’ hands after hospital duty. Another study cultured the skin lesions of 100 pediatric patients. The top isolates were SA, coagulase-negative SA, Streptococcus spp, Enterobacter spp, and Escherichia vulneris. The sensitivity of these organisms to penicillin, oxacillin, erythromycin, fusidic acid, mupirocin, and vancomycin varied significantly, demonstrating low to high susceptibility, across the different isolates (Fisher exact test = 0.000; p < .05). In marked contrast, sensitivity to monolaurin did not significantly differ across the different bacterial isolates (Fisher exact test = 0.110; p > .05), reflecting high antibacterial activity. My patients, independent of my medical advice, decided to try their own experiments. I, as a licensed physician, cannot advise them to experiment, with unknown and untested modalities of treatment. I offered them the information I had obtained from my research, conducted tests to determine if they were infected with H. Pylori, and offered them the standard medical treatment. They refused my standard treatment and told me that they wanted to try virgin coconut oil, one teaspoon three times daily. I advised them of potential adverse consequences, which they totally rejected. I, as a licensed physician of the State of Florida, am legally obligated to follow the Good Standards Medical Practice, as outlined by the Board of Medicine of the State of Florida. Also, as Doctor of Medicine and Surgery and a Graduate of the University of Bologna, Faculta di Medicina e Chirurgia, I took the Hippocratic Oath upon graduation. As a former U.S. Marine, I take all my oaths seriously. I do not believe that I can change the intent of my oaths, whether in the military, in medicine or even in marriage. Therefore, although I feel that there are hundreds of excellent alternative treatments for diseases, I always advise my patients that the medical profession has a standard treatment, however, the natural treatment may be better. I explain my reasons for my belief, and I advise them that they are free to choose whichever treatment they desire. In this way, I comply with the law, with ethical constraints, yet, try to give the patient enough information to make a wise decision. This method has proven to be above reproach and has yielded excellent results. I could do no more. My patients are free citizens. They were not about to take a deadly poison. Millions of people in Asia ingest much larger quantities of coconut oil with no ill effects. Their question: Would coconut oil, which is bactericidal, kill the Helico Pyloric Bacteria in their gut? In approximately one month, we had the answer. It was a resounding YES! Upon repeat testing, none of my patients had evidence of H. Pylori. Also, their symptoms of acid regurgitation, stomach pain and burping disappeared. I, am now, of the firm conviction, that in some people, the ingestion of Virgin Coconut Oil, three times daily, can eradicate H. Pylori infections. I do not know if this natural treatment will work on all people. There simply is not enough evidence, or large trials. I seriously doubt that large trials will be undertaken, since there is no monetary gain involved for companies or governments. Those individuals suffering from H. Pylori infections may try on their own. There is no evidence that coconut oil is detrimental to the body. Billions of people ingest it daily, and no government had advised that it is dangerous.